Still no luck getting email notifications for new posts working again. But we’re working on it. Please keep coming back every day until we get it fixed. 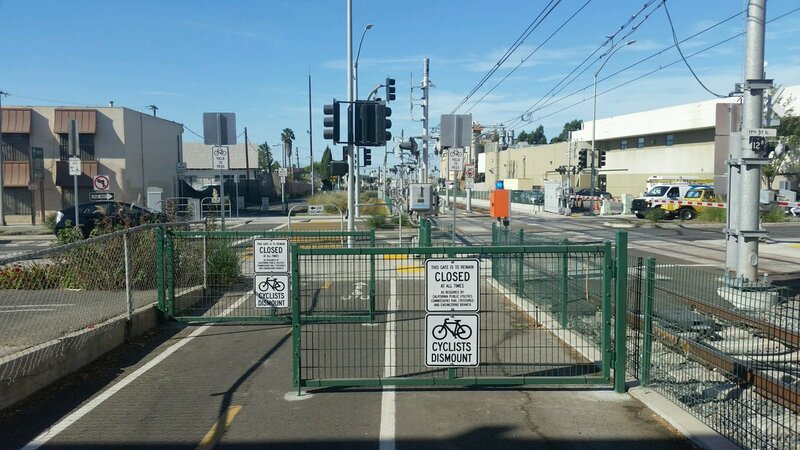 The Source reports that Santa Monica has installed a set of six staggered gates on the Expo Line bike path in order to slow bicyclists down before intersections. Or maybe make them dismount entirely. According to the press release, the locked gates are required by the California Public Utilities Commission to prevent conflicts with pedestrians at intersections at 19th, 20th and Stewart Streets. However, while the stated purpose is to get riders to slow down, the signs on the gates clearly say “Cyclists Dismount” for no apparent reason. Gates might make sense there if the purpose was to keep drivers from inadvertently turning onto the bike path, or if they were somehow intended to keep riders from straying onto the railroad tracks when trains were coming. Instead, they almost seem designed to defeat the purpose of the path by discouraging bike riders from using it. Especially if the absurd dismount requirement is actually enforced, rather than allowing riders to slowly weave around the barriers. There is no requirement under state law that bicyclists must walk across intersections, anymore than drivers are required to get out of their cars and push them to the other side. So it would be interesting to know just what the justification is for telling cyclists to dismount. And whether that comes from the CPUC, Santa Monica, or somewhere else. Thanks to John Hanson for the heads up. A bike rider suffered a possible broken leg when he was struck by a driver who took off without stopping in Costa Mesa Tuesday night. 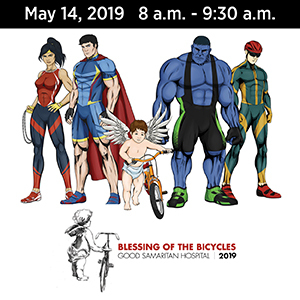 The Orange County Register reports that, based on the rider’s description, police stopped a gray Mercedes with damage consistent with the collision. After failing a roadside sobriety check, the 22-year old driver was arrested on suspicion of DUI and hit-and-run, both felonies. 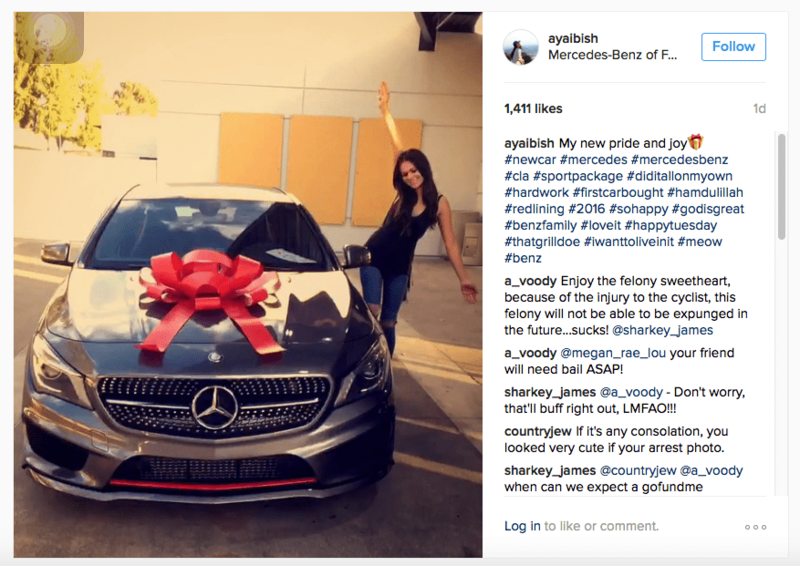 It didn’t take long for Instagram users to put two and two together, and realize it was the same woman shown posing with pride next to a brand new Mercedes Benz, which has apparently been purchased just hours before the crash. It also didn’t take long for the photo to be deleted after the negative comments started pouring in. However, as we all know, once something appears online, it’s usually there forever. Thanks to Jeffrey Fylling, Brent Bigler, and David Huntsman for the tips. Gabourey Sidibe is one of us, as she rides an adult tricycle between sets on Empire. Liev Schreiber is one of us, as he rides his kids to their New York school on a Dutch bike, complete with a wine crate for a basket. Maybe he’s been taking notes from LA Bike Dad. Or maybe Brooks saddles. J.K. Simmons is one of us as well, as he tells Jimmy Kimmel about bicycling home from his LA gym in 100 degree weather. Thanks to Megan Lynch for the link. 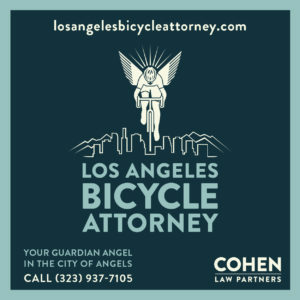 The LA city council approves a $3 million settlement for a bike-riding rabbi who suffered permanent brain injuries when he was struck by a car on Victory Blvd, just east of the 405 Freeway. The suit alleged that the posted bike route signs implied the dilapidated street was safe to ride, something most people who know the street would likely disagree with. 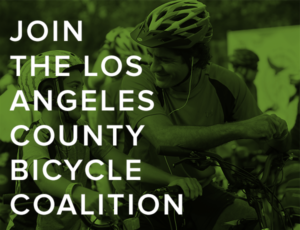 Maybe it would be better if LA spent its money building the bikeways called for in the 2010 bike plan, instead of paying damages to injured bicyclists forced to ride on dangerous streets. Streetsblog’s Sahra Sulaiman pens a challenging essay asking readers to look beyond their own privilege and consider not just bikes, but the people on them. Two men have been arrested in an Echo Park shooting believed to be gang related; at least one of the victims was on a bike. A NorCal cyclist received minor injuries when he was hit head-on by the driver of a left-turning pickup; a CHP officer somehow sees that as a reason to remind people about the state’s three-foot passing law, which had nothing to do with it. A writer recommends a serene 12-mile climb through spectacular scenery on your next bike vacation to Lake Tahoe. PRI’s The World reports on the Dutch Reach — opening your car door with your right hand, instead of your left — which makes you look back for bike riders before you open the door. The opening of a new Colorado bike path means cyclists can now ride a continuous 150 mile pathway along I-70 through the Rockies from Glenwood Springs to Denver. The Chicago Tribune says the city’s evolution as a leading bike-friendly city is next to meaningless if it doesn’t become a bike-safe city, as well. 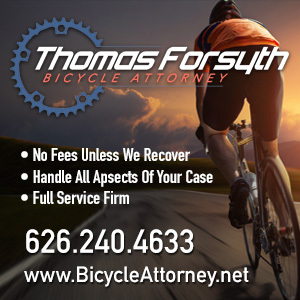 A Minnesota paper suggests banning cell phones from driving compartments of motor vehicles, and clarifying the definition of gross negligence after a judge acquits an accused distracted driver in the death of a cyclist. This is why people continue to die on our streets. Just a month after a South Carolina man was arrested for killing a cyclist and fleeing the scene while under the influence, he was arrested once again for DUI. As soon as drivers are charged with drunk or stoned behind the wheel, their licenses should be suspended and their keys taken away pending trial; the right of others to be safe on the road outweighs their privilege to drive. A New Orleans bike rider was doing everything right, yet still was the victim of a hit-and-run while riding in a bike lane. Nice piece from the Guardian, as they look around the world to ask why people on bicycles are considered interlopers on the streets, and whether drivers will ever learn to share them with bicyclists. An Edmonton, Canada paper recommends giving physically separated bike lanes a try, despite the city’s failed attempts at bike infrastructure; Calgary cyclists tell them they’ve been a tremendous success there. A new European safety campaign uses Formula 1 drivers to tell kids to “Stay Bright” on their way to and from school. A road raging British driver has been charged with chasing a bike rider and running him down, following an argument when she was reportedly driving distracted. The mother of a fallen British bike rider is relieved that the truck driver who killed her daughter in a left hook was spared prison time, saying there are no winners when something like this happens. A Paralympic champion had her specially adapted bike stolen just hours after she returned home to Great Britain. Horrible story from the UK, as a road raging bicyclist is charged with manslaughter in the death of a retired man who was pushing his wife in a wheelchair; the victim somehow hit his head on the pavement as a result of the dispute. Once again, never resort to violence, no matter how justified you may feel at the time. This rider should face the same consequences we’d expect of a motorist under similar circumstances. A DC website looks at how Barcelona gets bicycling right. Now you and your dog can both get a workout without ever leaving home. And there are no minor traffic collisions when you’re an assistant Ohio State football coach. On the other hand, there are no major consequences, either. Bicycling is my main form of transportation. I’ve ridden on all of the bike paths in the San Fernando Valley and all of them ,which run at street level, have intersections where the cyclist is treated like a pedestrian with push buttons to activate walk signals and steep ramps on the path to exit or enter the street. The whole point of cycling is to go faster than a pedestrian. This bicycle/pedestrian crossing in Santa Monica illustrates how absurdly bad bicycle facility design can get in the U.S. I can understand the need for crossing gates and signals at intersections for trains that are running above a certain speed, but not restricting the speed of bicycle riders to reduce potential conflicts with pedestrians. Contrast this design in Santa Monica with a very busy intersection in Amsterdam that has trams, trucks, cars, motor bikes, pedestrians and lots of bicyclists each deciding if and when to stop or go. There are no stop signs or traffic signals, only caution signs. The Netherlands has one of the lowest traffic fatality rates of any country and yet has by far the highest rate of bicycling. Here is a report about the differences between the U.S. and the Netherlands in bicycle facility design from two members of the federal highway administration (FHWA) who made a week long trip there in August of 2015.